Take boiled potatoes and mash it. Add peas, red chilly powder, turmeric powder, garam masala, salt, sugar, lemon juice and mix it well. Take besan, add salt, ½ teaspoon red chilly powder and make thin paste. This is just to make it wet so that bread crumbs stick on it. Take bread crumbs in a dish. Take papads and cut into two halves. Take water in a bowl. Wet papads with your hands on both the sides. Take one papad, put 1 tablespoon of mix and roll it. 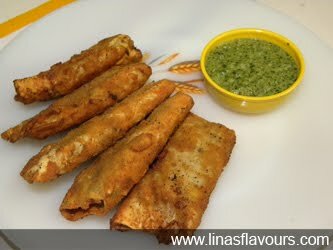 Deep the roll into besan paste, roll into bread crumbs and then deep fry. Make all the rolls like this.